A Crash Course in Printed Log Designs | by Paul Ziino – WELCOME TO OUR INTERNATIONAL SUPPORT! We are asked often how to edit or create a printed log design. Today we present a crash course in Printed Log Designs. For starters, go to Dataset/Schedule/Print Logs. For testing purposes, make sure you select a few valid hours—hours that have been scheduled—at the top of the Schedule Print screen. To create a new design, click the “New” button. An empty Log Designer page will appear. It is broken into three main sections: Fields Toolbox, the design itself and the Properties Toolbox. 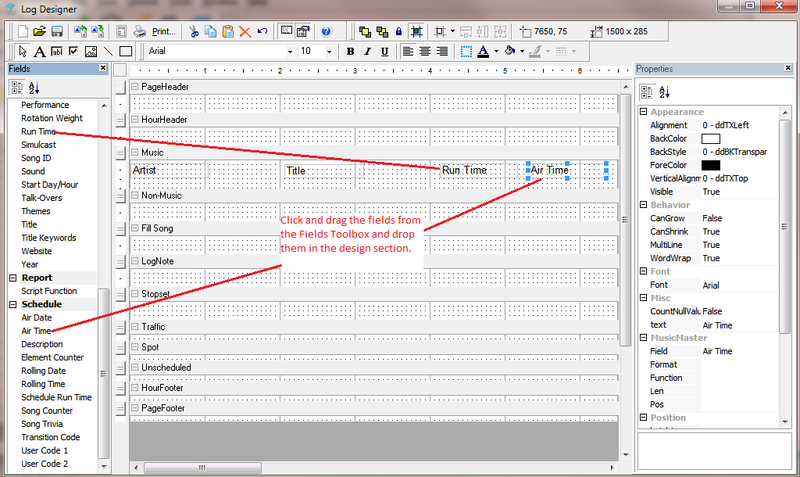 Basically, you’ll drag fields from the Fields Toolbox into the design then tweak it in the Properties. The center of the Log Designer page is where you build the print design. It is broken down into sections: PageHeader, HourHeader, Music, Non-Music, Fill Song, LogNote, Stopset, Traffic, Spot, Unscheduled, HourFooter, and PageFooter. By clicking on one of these sections, the Fields Toolbox will update with the fields available in the selected section. Let’s start by building our Music design. Click on the Music header in the design. All the available fields will appear in the Fields Toolbox. 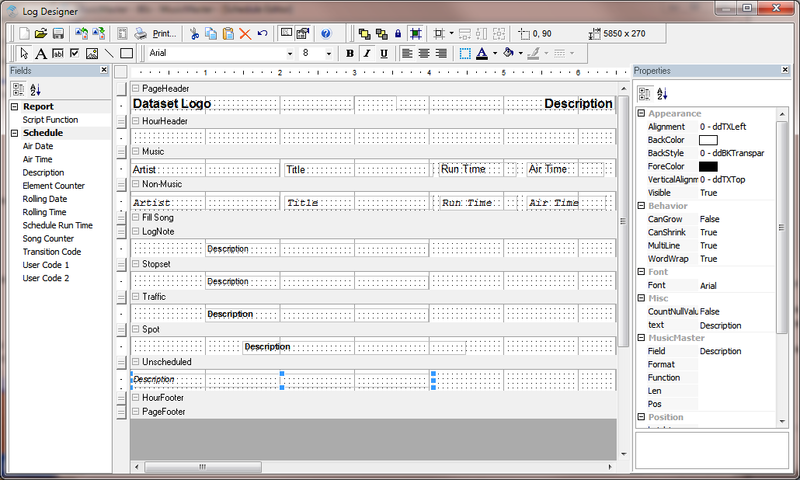 For our basic design, we’ll drag in the following fields: Artist, Title, Run Time, and Air Time. You’ll find most of these items alphabetically, except Air Time which you’ll find toward the end of the list under the header of “Schedule”. Now click on Artist within the Music section. It will have 8 blue dots surrounding it. Click and drag the perimeter of the box so that it is sized as you’d like. Then in the Properties Toolbox, change CanGrow to “True”. This will allow the field to get bigger if the artist’s name doesn’t fit in the allocated space. Do the same for Title. A good starting point is approximately two inches for each of these fields. Run Time and Air Time should fit within the default space when dropped into your design page, and shouldn’t need any Properties adjusted. You will want to go through similar steps to build a Non-Music design if you have Non-Music categories that you’d like to print on your paper log. It might be a good idea to select a different font, size, or italics for the Non-Music fields, that way they can be easily differentiated from the Music items in your printout. PageHeader will print at the start of every page whereas HourHeader will print at the start of each new hour. When you click on PageHeader the Fields Toolbox will update with the fields available to print in this section. It’s wise to include your Dataset Logo (the name of your database as established in Tools/Options/Dataset Identification) and Description (date and hour being printed on that page). You can size these fields just like you did in the Music and Non-Music sections. In our example, we’ve finished building the Music and Non-Music designs, italicizing the Non-Music fields and using a different font. We’ve set up the PageHeader with Dataset Logo as a bold 12 point font, left justified. Description is also a bold 12 point font but is right justified. If you use LogNotes in your clocks and wish for them to print, set up the design accordingly. Stopset design is for those LogNotes you’ve indicated are Sweep Markers in your clocks. If you use Traffic Merges in your clocks, set up a design for them and if you import commercials into your log you can print those as well in the Spot section. For all of those sections it is easiest to print the Description field which is the text of your lognote or stopset/sweep marker, the phrase Traffic Merge and the merge times of that item, and the Spot Title and Spot ID for your commercials in the Spot section. Should you desire to print something in place of Unscheduled positions in your log, you can set up the design for that, too. If you use the Description field, you’ll see the text as it would appear in your log for the unscheduled item, something similar to “Unscheduled Fixed: A – Powers”. 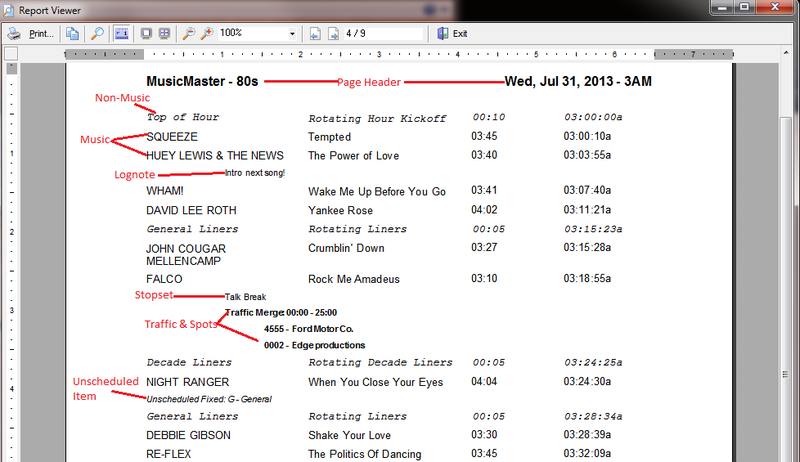 And if you’d like the page number, you can add that to the PageFooter or PageHeader section. In our example below, we’ve used the Description field for each of LogNote, Stopset, Traffic, Spot, and Unscheduled. Note how we’ve placed the items in different columns within the design and adjusted the font size and made traffic and spots bold. This way these items will be easily differentiated from the rest of the log. We’re not printing anything in HourHeader, FillSong, HourFooter or PageFooter. When you have your design set up as you’d like, click the Save icon (looks like a floppy disk) and give the design a name…make sure to save it as a New design, otherwise you’ll potentially overwrite another design. Now you can test it out by clicking the Print button at the top of the screen. Here’s what our design looks like on paper. Should you need to tweak your design, just Exit the Report Viewer and make adjustments in the Log Designer. Then click Print and check out the results.